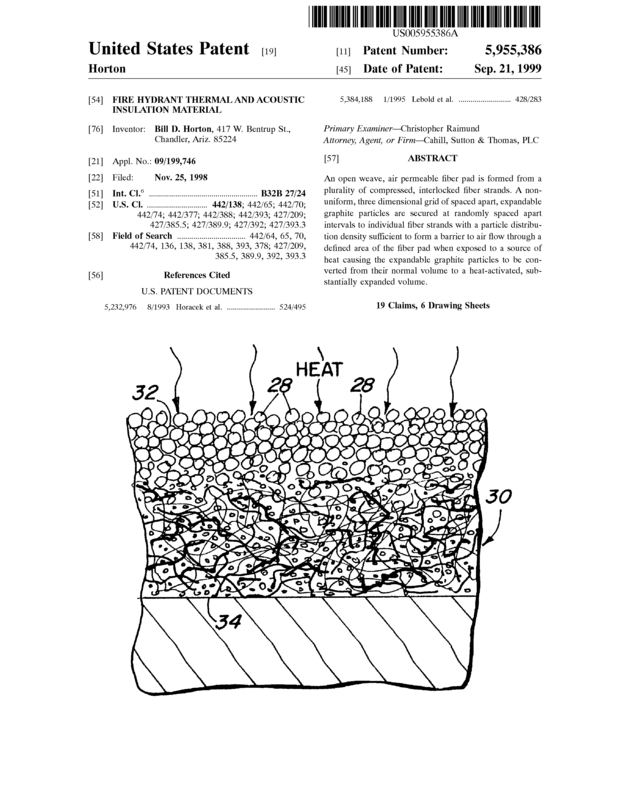 This patent covers a market-tested "green" insulation that provides protection from temperature and acoustic volume. The product uses recycled rag and expandable graphite which are both found in abundance. The recycled nature of the product aligns with the architect's need for LEED points in an ever expanding governmental requirement for easy to install thermo-acoustic insulations. The insulation may be formed into batt insulation for use inside walls and attic spaces or into thinner sheets for use as a thermo-acoustic insulation in RVs, automobiles, airplanes, and ships. A second patent to be sold as a package with this one is 5952248 which is a variation on the formula that meets United States Department of Transportation and US Coast Guard ratings for transportation. The patent is for the composition of the insulation. The insulation may be formed into a home insulation for inside walls and attic space or into a thinner sheet for use in RVs, cars, airplanes and ships. This is a market tested product that was sold under "The Insulator" in the early part of the 2000's. The product had a positive acceptance in the transportation market and is, today, installed in an aircraft at the Smithsonian Institute. The attraction of this product is that it provides thermo-acoustic insulation using rag and cloth that is headed towards landfills and it uses expandable graphite which is a byproduct of manufacturing aluminum. The recycled nature makes it attractive to architects that are shooting for LEED points. The end product is not irritating to human skin as standard fiberglass insulation may be. Expandable graphite has the nature of expanding when it is heated. In the case of fire, oxygen is pushed out by the expanding graphite removing one leg of the fire triangle. Product samples are available to serious inquiries. An open weave, air permeable fiber pad is formed from a plurality of compressed, interlocked fiber strands. A non-uniform, three dimensional grid of spaced apart, expandable graphite particles are secured at randomly spaced apart intervals to individual fiber strands with a particle distribution density sufficient to form a barrier to air flow through a defined area of the fiber pad when exposed to a source of heat causing the expandable graphite particles to be converted from their normal volume to a heat-activated, substantially expanded volume. The original patent holder was one of the first to create a mass produceable commercial "green" insulation. The product was released as "The Insulator" and enjoyed market success. Although this product was quickly growing it was still only one product in the business. The courts ordered a liquidation of all parts of the business in a bankruptcy caused by non-payment from a major account. The brand name "The Insulator" and patent were separately sold. The buyer of the patent was unable to resurrect the product due to an unexpected family tragedy which took him away from the new fledgling company. The buyer is now offering to sell both patents to a company who wants to enter into the "green" thermo-acoustic insulation market. The applications for this flexible thermo-acoustic material are many. The most obvious is to reclaim the transportation market which it was originally designed. The product is ideal for the initial manufacturing or retrofitting of RVs, classic cars, airplanes, or watercraft. Numerous customer testimonials are available. The larger market is in the building market. Awareness for buildings that are built with consideration for the environmental impact is growing. This market would be entered through both the architects desiring LEED points and directly to the consumer through home improvement stores and commercial building material distributors. Today there is one major player in the recycled insulation consumer market. The product is found at major home improvement stores across the United States. Video tests using a gas torch show that the expandable graphite product offered here holds up better to constant flame. These two patent are ideal for a company that would like to break in to the growing "green" thermo-acoustic insulation market. The patents give you a market-tested product in a market that, at this time, has few competitors. You will have a superior product and will be able to establish your brand easily. The patent is for outright sale plus transfer fees. Page created at 2019-04-21 18:54:33, Patent Auction Time.